This beanie can be crazy, fun, girly, tough, simple, outgoing, laid back…. ANYTHING! It’s all up to the colors you choose. Each stripe is slightly raised giving the hat some texture and really showing off the colors. So go nuts, or not, it’s up to you. Looking for the Kids Size? Check out my ebook at the top of the page to get a deal on BOTH kids & adult sizes! Buy this pattern plus 2 more and you’ll get a deal! 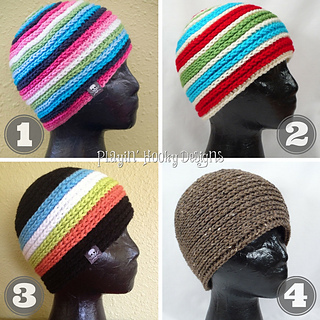 Use the code Pick3 during checkout for $2 off your purchase of 3 patterns! If you’re really in need of some great patterns, get $10 off when you buy 10 patterns with code Pick10. Don’t be fooled by imitations. This is the original Strata Beanie! Thank you to Kristy from Carriage House Portrait Studio for the photography!